What would be your first response? In October 2018, an electrical worker received burns to his hand, neck and face from an arc flash while he was terminating cables running to a switchboard. In September 2018, an electrical worker received burns to his hands when his pliers shorted two phases while attempting to fit a three-phase circuit breaker to a live switchboard. Before you start work you must identify hazards and put measures in place to control the risk of electric shock, explosion or fire. It is necessary in the interests of health and safety that the electrical work is carried out while the equipment is energised. (for example, it may be necessary for life-saving equipment to remain energised and operating while electrical work is carried out on the equipment). It is necessary that the electrical equipment to be worked on is energised in order for the work to be carried out properly. It is necessary for the purposes of testing to ensure the equipment is de-energised. There is no reasonable alternative means of carrying out the work. Never work on energised electrical equipment just because it is more convenient. You need to consider your environment and the nature of work you are performing. Working on or around equipment with a high fault level requires the highest levels of control. For a switchboard supplied by a 500kVA transformer, the fault level would be near 14,000 amps, which could result in an arc flash with temperatures of 19,400 degrees Celsius. In this circumstance the risks of working near the live parts can be just as dangerous as the live work itself, and you should de-energise the switchboard before starting work. Since 2013 there have been 32 incidents involving an arc flash. Of these, 20 resulted in injuries requiring hospitalisation. In the same period, seven notices were issued in relation to an arc flash. 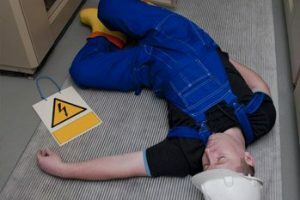 Each year there are around 48 accepted workers’ compensation claims involving a worker contacting electricity which results in an electrical burn. Roughly a quarter of these involve a serious injury requiring five or more days off work. Incidents involving contact with electricity in the construction and manufacturing industries account for 24 and 16 percent of claims respectively. Transformers and switchboards are statistically most likely to be involved in incidents causing electrical burns. In November 2016, a company was fined $30,000 after a worker sustained third degree burns to his left arm and superficial burns to his neck and face. The worker was one of three electricians working on an electrical fit out of a factory. The worker used a screwdriver to remove a circuit breaker from a live switchboard when an arc flash occurred, causing the switchboard to explode. The explosion was caused by the screwdriver making contact with the live 240 volt busbar and the earthed metal mounting of the switchboard. The company was prosecuted for failing to have in place a procedure for de-energising and locking out live circuits. 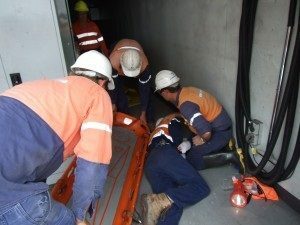 In the case of any medical emergency when working with any electrical, it’s so important for all workers to be trained on how to respond if an emergency situation does occur. 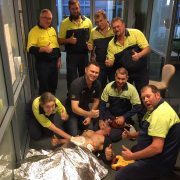 First Aid Accident & Emergency hold Low Voltage Rescue & CPR training courses at our two locations in Varsity Lakes and Coomera. 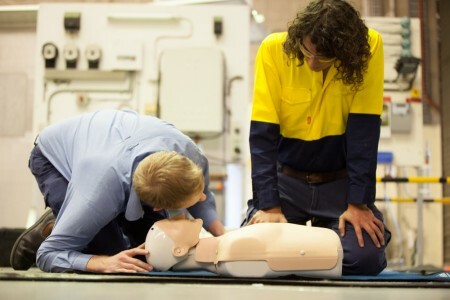 *Article originally appeared in Workplace Health and Safety Queensland.